The new T-1500 is now available in black and natural all aluminium chassis with Allnic in- house wound Permalloy nickel transformers. This 300B Integrated amplifier delivers 12.5 WPC in Pure Class A single ended style! Ruggedly built weighing in at 50 pounds, this 35dB gain powerhouse will drive most speakers of 90dB + efficiency to very comfortable sound pressure levels. 12.5 watts per channel of pure class A high power output. The T-1500 is a single ended power amplifier. Allnic’s powerful "Inductor Drive" circuit gives up to a 150V swing voltage, with very low distortion (about 0.3%). Real power drive. The driver tube, a PCL86, is a very strong power pentode/triode. We use this power pentode to drive the 300B’s via a choke plate inductor. Our choke inductor (100% nickel Permalloy PC core) has very low power loss and infinitely high load impedance. No separate preamplifier section. The T-1500 has only two gain stages, with a total gain of +35dB. The PCL86 driver tube gain stage receives the signal directly from the line inputs. The reduced number of gain stages means less distortion. Nickel alloy output transformer. Allnic uses sophisticated ratio mixed nickel Permalloy PB cored output transformers. Because of their extremely high initial permeability, it is possible to use lower turns on the primary winding while retaining very high 'open circuit inductance”. That means a resulting very wide frequency range and low distortion bass response. Long life and trouble-free operation. Allnic employs a “soft start circuit” to protect the tubes and other parts. It applies the high B+ voltage only after tubes are fully warmed-up. Fixed bias control grid. Allnic prefers to use low distortion and high output “fixed bias” rather than the relatively higher distortion and lower output “self-bias” method. Natural negative feedback. The T-1500 applies about -6dB of negative feedback. 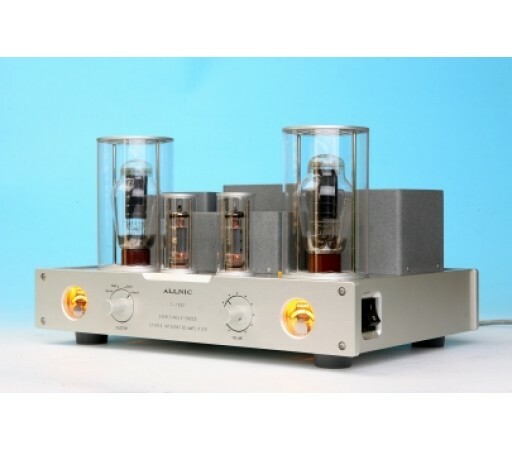 This is a very complimentary amount of negative feedback that differentiates the Allnic 300B single ended amplifier from the standard, which has a very coloured and weak speaker driving force. With this natural feedback, the T-1500 has a relatively high “damping factor', very low distortion, and a higher S/N ratio, without losing the signature single ended natural sound quality. We use a high quality 41 step silver contact attenuator (all resistors non-inductive) instead of a carbon filmed slide potentiometer. SEE OUR SPECIALS PAGE FOR DEMO MODEL ON SALE NOW! Click here to view the Product Manual and specifications.